Hydropower projects have a bad reputation in the environmental community, and rightly so. Large dam projects, like China’s Three Gorges, have flooded important habitats to create reservoirs. Downstream ecosystems are irreparably changed when a river flows according to the whims of engineers rather than natural cycles. But it’s time to think small. Moving water is a powerful force, and a growing number of homeowners are realizing that they can use its natural energy to cut down or eliminate greenhouse gas-belching power plants. Indeed, small-scale hydropower, called microhydro (systems producing from 100 to 300 kilowatts) may be an ideal—and inexpensive—option for homeowners who want to generate their own electricity. 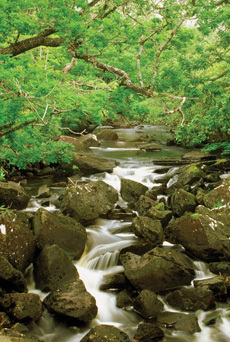 The environmental impact of microhydro is negligible if a "run of river" arrangement is used. This is the most common setup, and includes an intake pipe, which directs some of the water into a turbine that produces power. Fish and other small animals cannot swim through the turbine (screens to keep critters out are part of the piping). It’s important to check with your local fish and wildlife agency to determine how much water is ecologically sound (and lawful) to remove from a water supply. But most systems don’t require large volumes, and the water that’s returned to the stream after it has passed through the turbine is as clean as when it went in at the top. Figuring out how much power your water resource will provide is the first step if you are considering a microhydro set up. Do you have a stream, small river, waterfall or spring on your property? First you"ll need to assess two key variables: Flow is the volume of water moving through a given area, and head refers to the vertical distance the water travels as it moves. The proportion of head to flow is what gives you energy from water. "Every time a gallon drops 10 feet, or 10 gallons drop one feet, then you have a watt of power," says Scott Davis, author of Microhydro: Clean Power from Water (New Society, 2003). If you think you have enough head and flow, take a look at seasonal changes and compare them with when you"ll need the energy. "How much does your water source dry up in the summer? Does it freeze in the winter? When do you need the power?" asks Brian Dempsey, technical advisor for Real Goods. Dempsey says microhydro systems can be a great complement to solar panels, since streams and rivers run higher volumes in the winter when there is less solar energy (especially if you live in an area with cloudy, short winter days). Conversely, when solar panels are most effective, in the summer months, water resources tend to run lower. The ideal setup for a microhydro system seems to be one where you have a high head (25 to 100 feet) and a regular volume of water, but there are turbines that will take advantage of different conditions. The Harris turbine is recommended for a head of 25 feet or more; the Stream Engine works with heads as low as two feet. "There’s a lot of power in slower-moving water as long as there’s enough volume. You can get usable amounts of energy from sites with as little as two feet of head [equivalent to a two-foot high waterfall]," says Davis. Unlike solar panels, microhydro systems are fairly inexpensive, though it all depends on where you locate them. "Ideally, you want to site a microhydro system close to your home," says Dempsey. This will cut down on one of the biggest costs, installation and piping, which can rise quickly if water or electricity has to be moved over long distances. Aside from a filtered pipe, which will remove water from the stream, you"ll need a few other major pieces: the turbine, which turns the energy of the moving water into rotational power; the generator or alternator, which turns that power into electricity; and a regulator, which will make sure you get a consistent flow of electricity. Of course you also need wiring to take the electricity into the house or to a battery. The latter option will allow you to store electricity for use later on. Since microhydro systems are so site-specific, costs will vary from a few thousand dollars to much more, so do your research and solicit expert opinions, whether in the form of books or videos (Real Goods offers both), or finding an installer in your area. Generating your own electricity is not as difficult as it sounds. "Most people who buy our systems do their own installations; it’s pretty common since there aren’t that many installers out there," says Dempsey. Whether you hire an expert, or figure it out yourself, microhydro will save you money on utility bills faster than solar panels will, and clear the air as soon as it gets going. 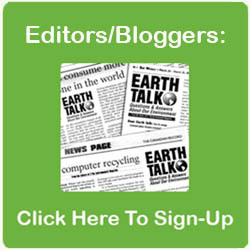 STARRE VARTAN is an E contributor who runs eco-chick.com, a blog about women and the environment.